I’ve found that I take great joy in experimenting with different ways to store and organize clothing and other household stuff. At the moment, I have relatively few clothes, and most of them fit into two milk crates. 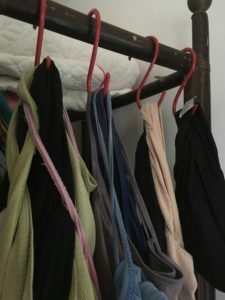 I use four red hooks to hang four categories of my most constantly-used clothing items: bras, underpants, tank tops, bottoms (including swim-skirt). 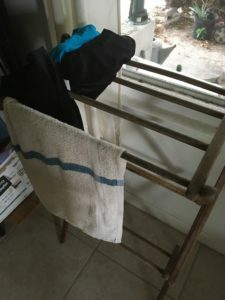 And sometimes my drying-rack ends up getting used as a hanger. At times of my life I have had a lot more clothes than this. At this time of my life, I find it more liberating to have not as many items. I am one of those people who found herself wearing 20 percent of her clothes 80 percent of the time. Particularly after moving to ultra-humid Florida. And so I adjusted accordingly by getting rid of clothes I wasn’t wearing. The milk crates sit in a piece of furniture which I scrounged at curbside and dubbed my “clothing hutch”. My bedroom is a lot bigger and has much more clothing storage than I need. 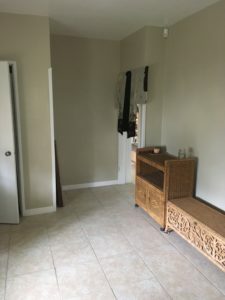 The closet is empty, as are the wicker chests. Once I find likeminded housemates to share this home with me in the long term, one of them will get this bedroom and I’ll probably sleep in my micro studio. For now, I’m enjoying my experiments with the large bedroom space. 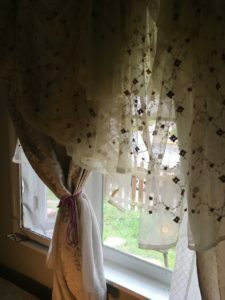 The rose mesh curtains (fabric bought from a vintage thrift shop), plus the kimono which I use as a substitute for the missing door, add a touch of pretty that keeps the room from being too spartan for my tastes. 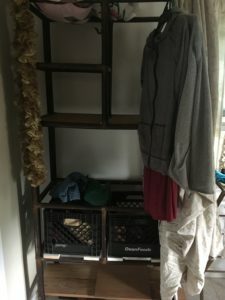 I first used the “clothing hutch” when I was renting a one-bedroom apartment and sharing it with a roommate. The roommate got the back bedroom, and I had a partitioned area in the living room. The hutch helped create the partition, and it was a real boon for space! Experimenting with the hutch has been fun. I loved my little “roomette” (see photos below). Note, you can’t see the hutch in these pics; it’s outside the photo. 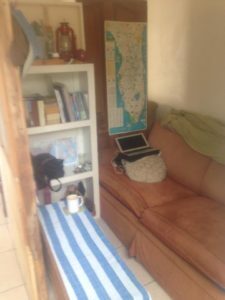 I just wanted to show you my cozy sleeping, working, and reading space. Very RV, or very NYC! When I experiment with various living-space arrangements, sometimes I feel like a kid building a fort out of blankets and pillows. It’s a joyful, creative experience. I encourage you to try it! Tip: Using curb-scrounged or thrifted stuff takes the pressure off to be “designer perfect.” This pressure takes a lot of the fun out of having a home. Let’s get rid of the pressure! Have fun experimenting. And if you have kids, bring them into it! Kids have such creative ideas, and it’s a fun way to spend quality time together as a family. 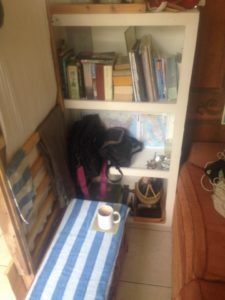 I keep my room as tidy as possible because it helps me feel relaxed and peaceful in the room. 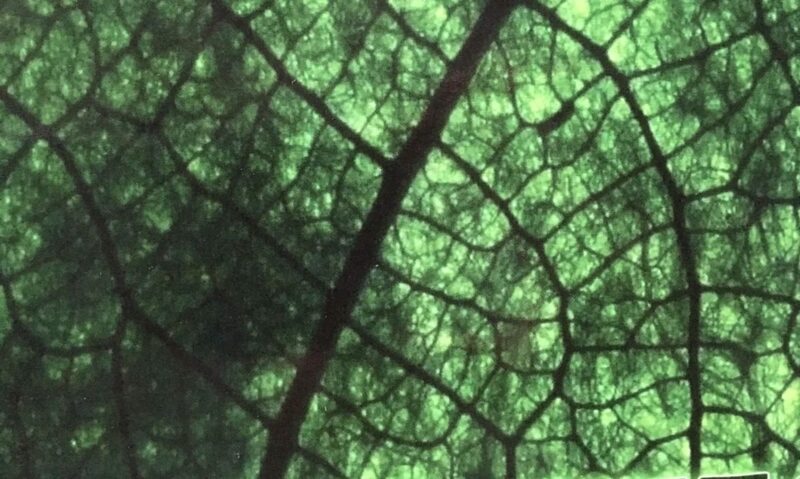 I think of it as a nice subdued backdrop to the wild, jangly-colored notes of my art, writing, and life. 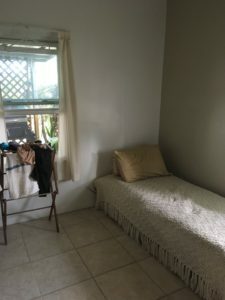 Further Reading: Check out this neat post I just found on makespace.com: 11 ways to divide a studio apartment into multiple rooms. I particularly like the “movie projector screen wall” — great for video nights! And another post to stir your creative juices, this one from Life Storage Blog: 10 clothes storage ideas when you have no closet.